Idly or Idli is a savory steamed cake that is often eaten, as a side dish, appetizer or snack in India. It is normally eaten with a lentil curry, called Sambar (recipe tomorrow). The batter is very simple, made with a lentil called Urad Dhal (Dhal means lentil) and Idli Rava (or cream of rice) that is first soaked and then blended together, with some salt (to taste). Then, the whole batter is fermented (and it nearly triples it size, so make sure you use a big container). The batter, in the end is very fluffy and almost looks like soft peaked egg whites. The batter is then poured into special molds and steamed for 10 minutes. I remember when I was young, we would either go to Jackson Heights, New York and enjoy Idly and Sambar, along with other treats, like masala dosa, bhel and pani puri. To this day, having, what my family calls “Indian Junk Food” was such a treat. When I went to college, I introduced my husband to these treats and now he loves them, as much as I do. We even served pani puri (his personal favorite) at our wedding! 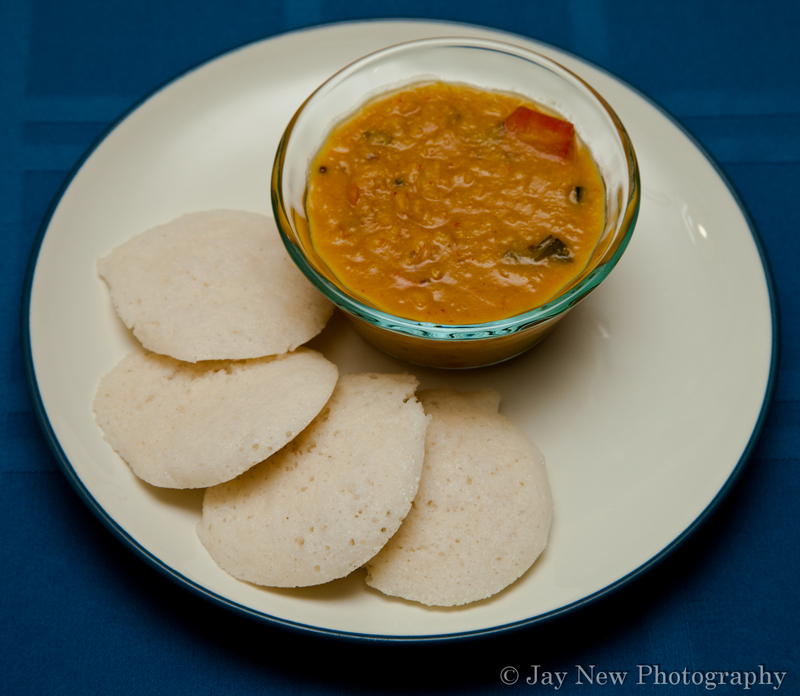 This is the first time, I have ever tried to make Idly and Sambar, from scratch. There are many ready-made mixes, where you can just add water and start steaming them but I was always dissatisfied with the packaged Idly. They became hard very quickly. Homemade Idlys, stay soft for a long time and the batter and/or the steamed Idlys can be frozen. I hope those of you who like to try Indian foods, give this recipe a try. It is a very easy to do Indian dish and it easily makes many servings. If you don’t have a special Idly mold, small custard cups or molds will work just as well. If you are using uncooked white rice, soak rice in water for 4-5 hours, then drain and grind into a course powder. After the Urad Dhal has soaked, place dhal into a blender. Blend using just enough water to allow contents to be blended. Cover with saran wrap and place in a warm area. Boil about 2 inches of water in a big pot that has a lid (The level of the water must be lower than the lowest tray on your idli stand (or mold) so the idly can steam. Allow idly to rest for about 30 seconds before unmolding. YUMMM. This sounds so delicious. Can’t wait for the lentil recipe, I’ve really been wanting to make it but never settled on a recipe! Sounds amazing with these cakes!!! I will get it posted as soon as I can 🙂 Happy Cooking! When I decide to do this (and I will-I make indian food for myself at least twice a month, and iddly would be PERFECT compliment), I’ll take you up on your offer. Oh my GOD I’ve always wanted to make these. Where do you get the molds though.